Even with all that clearly going for it, though, it’s not uncommon for folks to have a few questions before making their move, and as a community service, we’ve decided to field a few of the more frequent queries so that you can have a better understanding of what you’re getting into when you come to this fantastic little Northwestern city. From the size of the city to the best places to live and work, people frequently ask about the lesser-known details of this urban paradise. Thankfully, the answers to such questions are easy to produce, and we’ve got them all collected for you right here. If you’re talking about the size of the area, the city of Bellevue “spans more than 33 square miles between Lake Washington and Lake Sammamish.” According to the official statistics, the total area of the city is 36.47 square miles, with 31.97 of those miles being land, and 4.50 being water. It’s a smaller space that makes getting around plenty easy. If you want to know about population size, however, that’s a different number. Bellevue, according to the 2017 census estimate, has a population of 144,444 people. It’s the third-largest city in the Seattle Metro Area, and the fifth-largest in the state of Washington overall. In terms of demographics, Bellevue is becoming more diverse. During the 2010 census, approximately 62.6% of the population was white, while African Americans represented 2.2%, Native Americans represented 0.4%, Hispanics represented 7.0%, Asians represented 27.6%, Pacific Islanders represented 0.2%, “Other” races represented 3.1%, and mixed-race individuals represented 3.9% of the population. A more recent 2015 census, According to Visit Bellevue, indicates that now, more than half of Bellevue’s population comes from a minority ethnicity, and “42 percent speak a language other than English at home.” Among all of Bellevue’s residents, education is highly-valued. And data indicates that more than 66% of the population holds a bachelor’s degree or higher, as of 2015. How Did Bellevue Get Its Name? You can learn more about the history in intervening years from Bellevue’s official government page, but to make a long story short, this once simple farming and mining community incorporated in 1953, and in the time since, has developed a beautiful downtown and morphed into a high-tech beacon for commerce and innovation. Overall, temperatures in Bellevue stay mild. In the summer months, you’ll see the thermometer shoot up to about 75 degrees Fahrenheit, while in the colder months, it might drop down into the 30s occasionally. What Bellevue lacks in temperature extremes, however, it makes up for in rainfall, and the total annual precipitation during the year is about 40 inches. It doesn’t come on just a select few days either. You’ll see about 150 rainy days, or even more, living here, so be sure to pack your umbrella (or at the very least a rain jacket). What Are the Best Areas and Places to Live? If you’re trying to nail down which neighborhood would best fit your lifestyle and personality, we recommend checking out the neighborhood profiles, which break down the demographics and character of each area. With this info, it’ll be easy to tell what appeals to you the most and finally make that move to the city. How About the Local Economy? 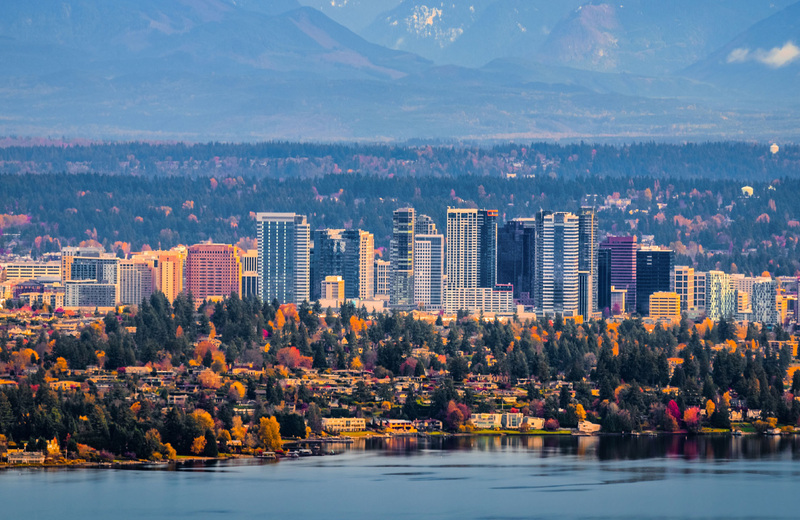 Bellevue isn’t just a great place to live, it’s also a great place to work, especially if you’re after a job in the technology field. According to Forbes, Bellevue, along with Tacoma and Seattle, top the list for tech jobs, and there are plenty of big businesses, like Boeing, Microsoft, Safeway, and T-Mobile, who have centers in the area. If you’re looking for the perfect place to move to in Bellevue, you needn’t look further than the fabulous apartments at Hyde Square. Luxurious, spacious, and representative of a new kind of urban experience that blends modern comfort and design with an old-school feeling of community, this is the way living in the city was meant to be. Discover everything that Hyde Square has in store, and make it your first choice for a new life in beautiful Bellevue, Washington.